FLEXIBLE FLYING OPTIONS - Headless flying mode and speed select make it easier to adjust to any user's flying skill level. AUTO HOVERING - The advanced altitude holding technology allows the drone to suspend in the air hands-free when you let go of the remote. ONE-KEY STUNT MOVE - Fun 360-degree rolling stunt trick can be performed with one button to make your flight even more impressive. FLEXIBLE FLYING OPTIONS - Comes with headless flying mode and speed selection to make it easier to find a flying setting to suit each person's skill level in your family. Enjoy this unique Easter toy drone, folding egg quadcopter with the entire family. 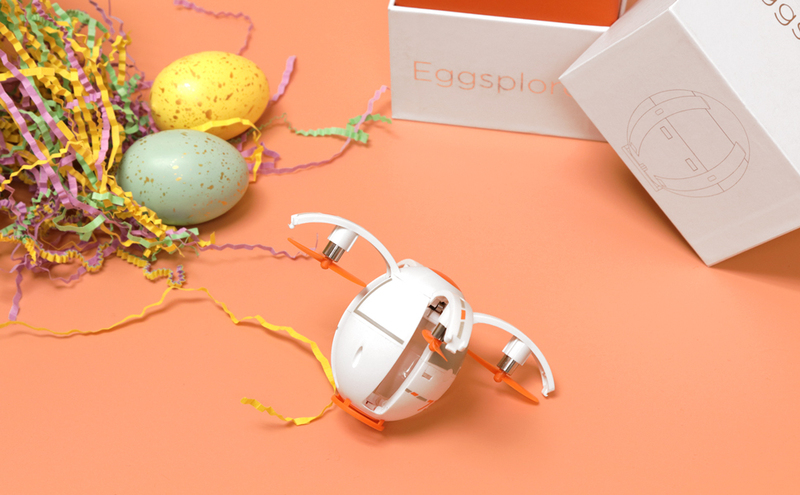 TRANSFORMABLE DRONE - A great Easter basket stuffer, morph from an egg to a quadcopter drone with just a press of button on the mini RC drone. AUTO HOVERING - The advanced altitude holding technology allows the drone to suspend in the air hands-free when you let go of the remote, making it easy to fly and easy to maneuver. Perfect mini drones for kids, beginners, and starters. NOTE: DO NOT fly in windy conditions. ONE-KEY STUNT MOVE - Fun 360 degree rolling trick stunt drone can be performed with one button to make your flight even more impressive.